This year promises to be one of the best Vueltas in years. There’s a very strong line up including Tour de France winner Chris Froome as well as TDF podium riders Nairo Quintana and Alejandro Valverde. The Tour of Spain or to give it its proper Spanish title Vuelta a España – Vuelta for short – is the third biggest bike race in the world. It’s the the third and last Grand Tour of the year following the traditonally more prestigious Tour de France and Giro d’Italia races. The Vuelta is the smallest of the three Grand Tours in terms of prestige but it’s not really any less difficult or arduous than the other two and it is still a major victory that any rider would like to have on their CV. The race is three weeks long. It starts in Andalusia in the town of Porto Banus on Saturday 22nd August with a 7.4km team time trial. It makes its way around Spain in a very disjointed anti-clockwise direction. Spain’s a big country so there’s lots of long transfers between some stages to bring the race to all parts of the country. It all finishes in Madrid with a 98km flat stage – ideal for the sprinters – on Sunday 13th September. This year’s race covers a total of 3,357km (2,098miles). This is just 3km shorter than this year’s Tour de France – almost certainly not a coincidence. There are 21 stages in total. The riders have just two rest days during the race on the second and third Tuesdays. How old is the race? 2015 is the 70th edition of the race. It was first run in 1935 but stopped during the Spanish Civil War and Second World War. It has been held uninterrupted since 1955. 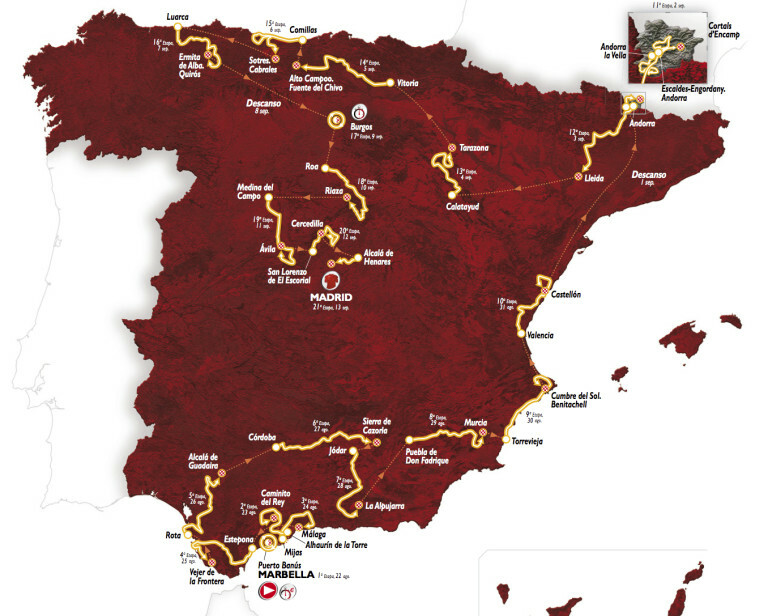 Will 2015 be a vintage Vuelta year? The Astana duo of Vincenzo Nibali and Fabio Aru will also be ones to watch as they are both hungry for the win. Seeing how they get on working with each other will be like watching a soap opera. What sort of rider does it suit? There are nine summit finishes in this year’s race making it one for the climbers. There are only two individual time trials – 7.4km on day one and 39km on stage 17 – so not very much useful time advantage can be made if you’re useless in the mountains. Expect to see some thrilling battles between Froome, Quintana, Nibali and Aru in the high mountains. No, the shortest is the first stage which is a 7.4km team time trial against the clock. The shortest regular road stage is stage 21 which is 98km. The longest road stage is stage 14 which is whopping 215km including a daunting 2000m summit finish. The rest of the stages are of varying distances with four over 200km and the rest approx 150-180km. Riders must ride and finish all stages and the overall winner will be the person who covers each stage in the lowest aggregate time. Apart from the overall winner and stage winners, there are also several other classifications for riders to battle for with their own unique jersey. Red jersey = Overall Leader’s jersey. Tider with the lowest aggregate time overall. Green jersey = Sprinter’s jersey. The most consistent placed finisher on each stage and the multiple sprints during the stage. White with blue polka dot jersey = Climber’s jersey. The most consistent rider in the mountains both along the route and at the finishes. White jersey = Best all rounder. Based on rider’s overall mountain and points jerseys position. Rider’s positions in all three categories are formulated together to give an overall score. There are four main contenders to win the race overall. Last year’s winner Alberto Contador (SPA) Tinkoff-Saxo, isn’t riding as he has already ridden (and won) the Giro d’Italia and the Tour de France this year. Three Grand Tours in a year is a bit too these days. Froome just won the Tour de France for the second time so it’s hard to say whether he’s still in good condition or not. How much did the Tour take out of him? He was second in last year’s Vuelta. Runner up in this year’s Tour de France. Quintana won the Tour of Italy in 2014 so he knows what it takes to win a Grand Tour. He was just about the strongest climber in the Tour this year so expect to see him stamp his authority on the summit finishes. 2014 Tour de France winner. 2014 Vuelta winner. Nibali has been a bit off the boil this year so will be looking to make amends at the Vuelta. The experienced Spaniard finished third in the Tour this year and always goes well at the Vuelta. He’s won the event previously so knows what it takes but will be limited by having to work for Quintana. If Quintana looks unlikely to win then Movistar may switch Valverde to be the Main Man. Runner up in this year’s Giro so he may be looking to go one better here. Although he is scheduled to be Vuelta team leader he may have to work for Nibali if Nibali’s form has improved. it will be interesting to see who is going best and how team dynamics work. The American was riding well at this year’s Tour before abandoning through illness half way through. Is eager to show his major stage race credentials but is still a relatively unknown at this level, could be a breakthrough race for him. He’s opting to race the Vuelta instead of the USA Pro Challenge which he has won for the previous two years,, so it’s clear that he means business. The Vuelta has yet to get very much Brit action. This year there will only be three Brits taking part. Chris Froome (Team SKY) – finished second twice and main contender for overall. Geraint Thomas (Team SKY) – has just had a stellar Tour de France helping Chris Froome to the win. Will Froome repay the favour and work for Thomas in the supposedly lesser race? Steve Cummings (MTN-Qhubeka) – just won a stage in the Tour de France and has already won a stage at the Vuelta back in 2012 so he will be trying to add to his tally. Yes, two and they’re cousins. Dan Martin (Garmin-Cannondale) – team leader and excellent climber so looking for stage wins as well as high GC. This is looking like his last race for his current team so he will be looking to go out on a high. Nicolas Roche (Team SKY) – has finished fifth overall before but will be here as a key helper for Chris Froome in the mountains. This short team time trial will be like an extended team pursuit. All teams will be flat out making this one to watch as riders struggle to keep such a high pace for such a short time and stay together. A lumpy stage with a summit finish which is just over 10km long at 10% on a narrow climb. A short stage but with six categorised climbs and 5230m of ascent this will be a brutal day especially in the heat of southern Spain. Last big summit finish of the race and crucially before the time trial the next day. Relatively short but the only opportunity for the strong time trialists to take time out of the pure climbers after all the mountain stages. Yes, Eurosport will be showing the race live each day as well as highlights each evening. ITV4 will be showing highlights of each day’s stage each evening. Tagged chris froome, froome, grand tours, proi cycling, racing, team sky, tour of spain, vuelta, vuelta a espana. Bookmark the permalink.